Let us know your preferences, interests and priorities. When would you like to visit Turkey; what places would you like to cover during your stay; what information would you think we should know about you so that we can offer the most convenient program? Please proceed and complete our questionnaire. How many people are there in your party? Will there be elderly people travelling in your group? If yes please specify the number. 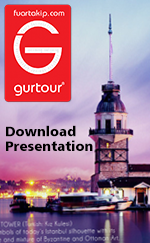 What are your " must see " places in Turkey? Which star rating would you prefer for your accommodation? How do you plan to travel within Turkey? Select... Public transportation Fly & drive Private vehicle with driver What type of a service would you like to take?